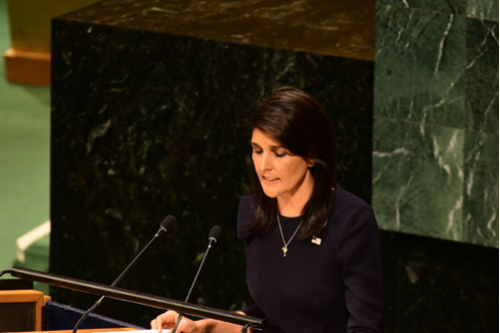 Nikki Haley made it clear in presenting the failed resolution that would have designated Hamas as a terror organization, that the Hamas charter, in calling for the murder of Jews alone, is antisemitic. Haley also made it clear that when the UN condemns Israel, but not Hamas for murdering Jews, the UN sanctions antisemitism. And still, that resolution failed to receive the 2/3 majority vote required to pass. Since the failed vote has occurred, Hamas has stepped up its antisemitic terror activities in Judea and Samaria, with the result that a pregnant woman, gravely injured, had to be delivered prematurely. Her baby, posthumously named Amiad Yisrael, lived four days, before succumbing to his wounds. As long as the world has an excuse to think of it in another, politically correct way, an Arab is safe to shoot whatever Jews he likes, whether it be a pregnant woman and the baby in her womb, or a couple of teenage girls. Europe looks the other way. The UN looks the other way. The New York Times looks the other way. The question is why Jews look the other way. Even the Arab terrorist, now dead thank God, couldn’t puzzle that one out. To him, in his short evil lifetime, Jews were Jews. No matter who shed their blood. No matter that their condition marked them among the most vulnerable sectors of society. An old woman in Tree of Life Synagogue in Pittsburgh, in this respect, is exactly the same as a young pregnant woman standing at a bus stop in Ofra holding life inside her womb–a life soon extinguished. The dead Arab terrorist knew there was no essential difference between him and Robert Bowers. He actually felt a lot of sympathy for Bowers, when he thought about him. After all, he hated Jews and Bowers hated Jews. Hates them still. The Arab terrorist saw Jews as less than human. So did and does Bowers. When he thought about it, the Arab terrorist who shot Shira Ish Ran and killed her baby, knew that the only difference between him and Robert Bowers was that there was no possibility that Bowers would ever be set free in a prisoner exchange or receive a large government pension for killing Jews. Had the Arab terrorist not struggled during his capture, he would have ended up on easy street in a comfortable Israeli jail. Previous Failed UN Hamas Condemnation: 3 Rockets Daily for 17 Years!